We've all had one. 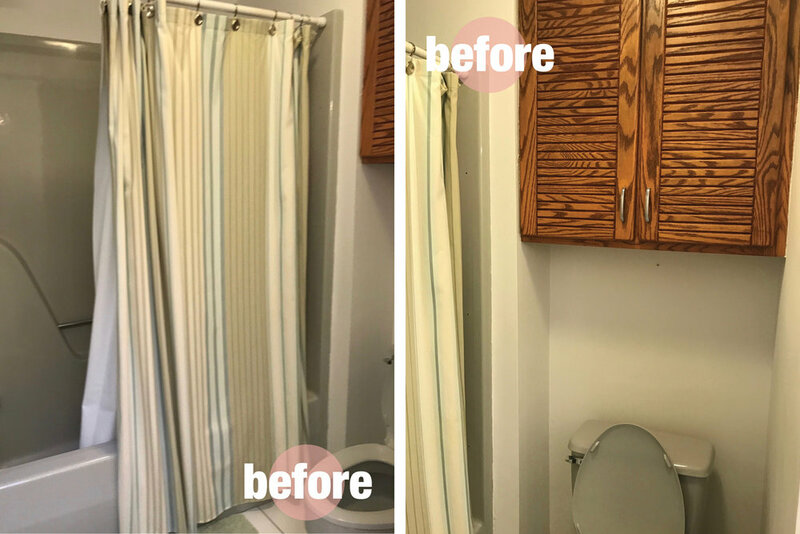 The shower grout is moldy and the tile is rotting out of the wall, the vanity is ugly, the floor has collected years of gunk that has since been smashed into each nook and cranny, the fixtures are the cheapest whatever from Home Depot, the colors are bad. 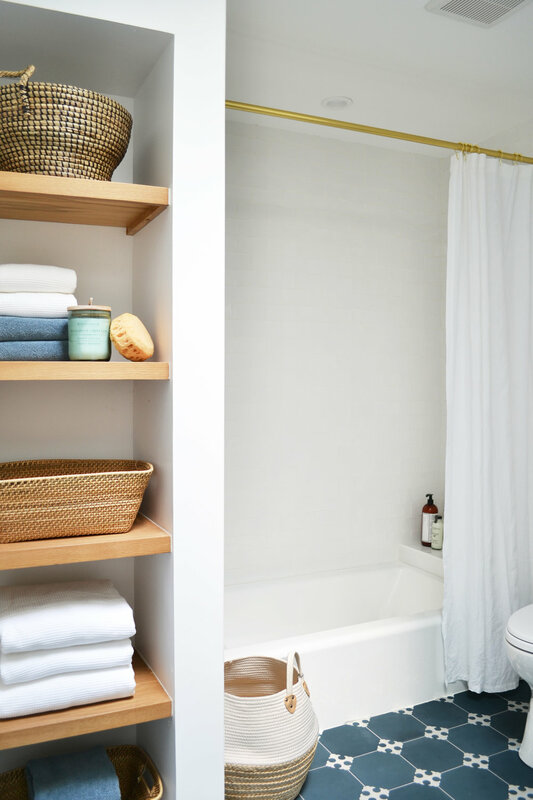 I could go on and on, but what we really want to discuss today is how to make your moldy hot mess of a rental bathroom less nasty. 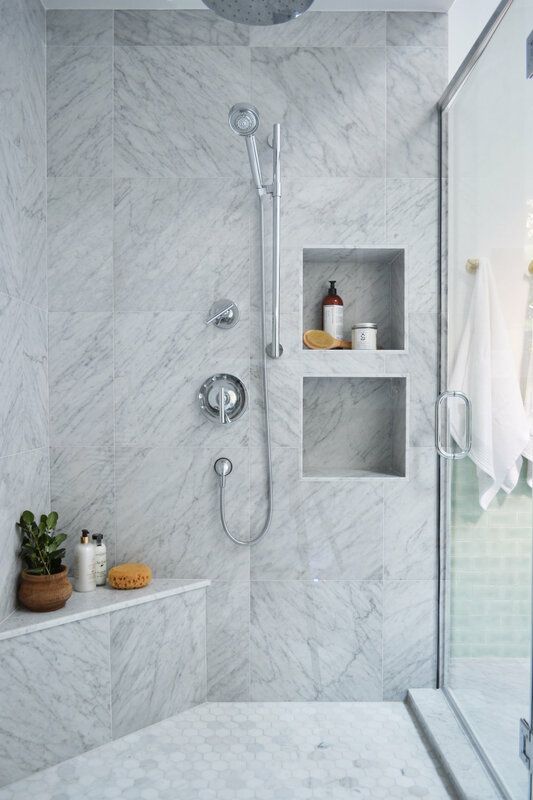 How do you fix up a bathroom that isn't really yours but you have to live with for the next year or two or more? We'll tell you AND show you. This was our bathroom after they came to fix the leaky faucet and found themselves tearing out the shower tile and removing the cast iron tub only to find rotted out studs, HGTV style. It was 3.5 days without a shower but it was SO worth it, many thanks to dry shampoo. We lucked out that the tile chosen was kind of decent! Once our tile was brand-y new, we realized what a dump the rest of the space was. We had moved into our apartment with the bathroom floors previously painted very poorly. 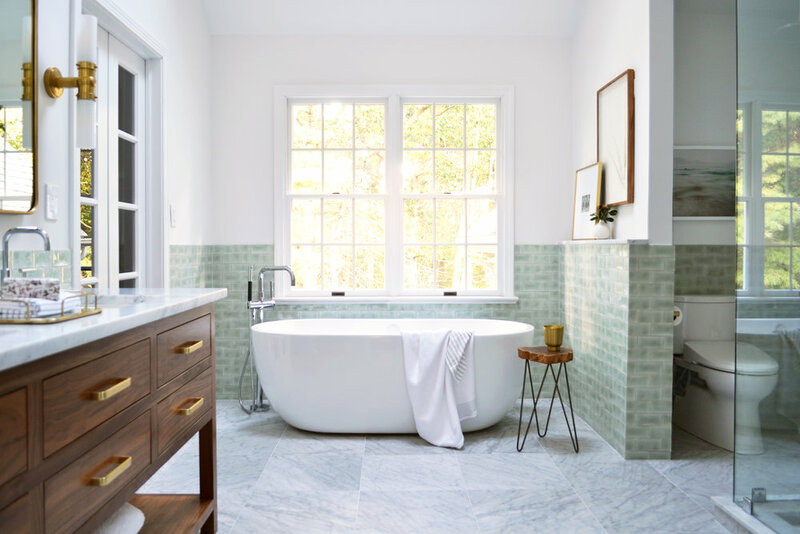 (Side note: we don't really suggest painting tile. 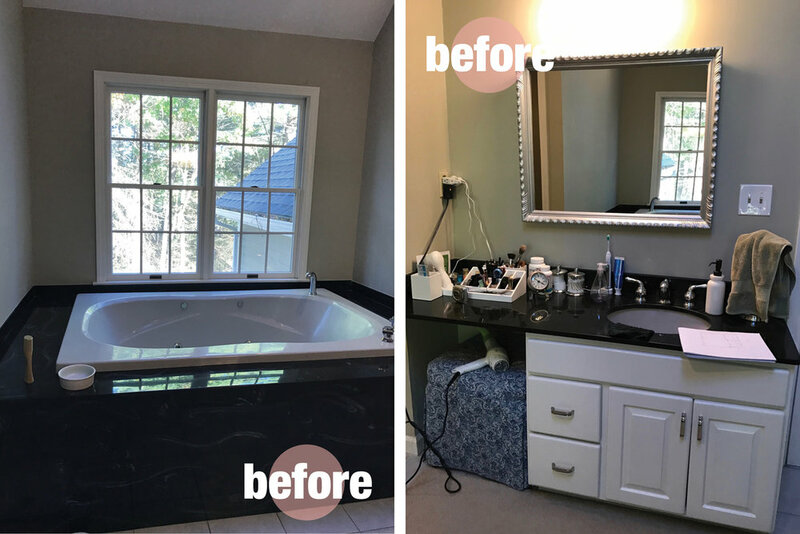 You will find all kinds of tips and tricks on Pinterest and while it's an immediate transformation, it will last literally 1 second until you walk on it with shoes and think if you had only sanded a little harder or primed just one more coat. But in the end, paint and tile just aren't meant to be.) So we took a weekend, scrubbed the place down, painted a darker color over the already painted floors, replaced the towel rod and tp holder, and painted the walls, ceiling, and heater white. The walls were already white and needed to remain so in order to draw less attention to the messy corners, probably from the previously existing 97 coats of paint. The white was WHITE. And the space, although much cleaner feeling, still felt cold and bare. So, I styled the bajeebies out of it. 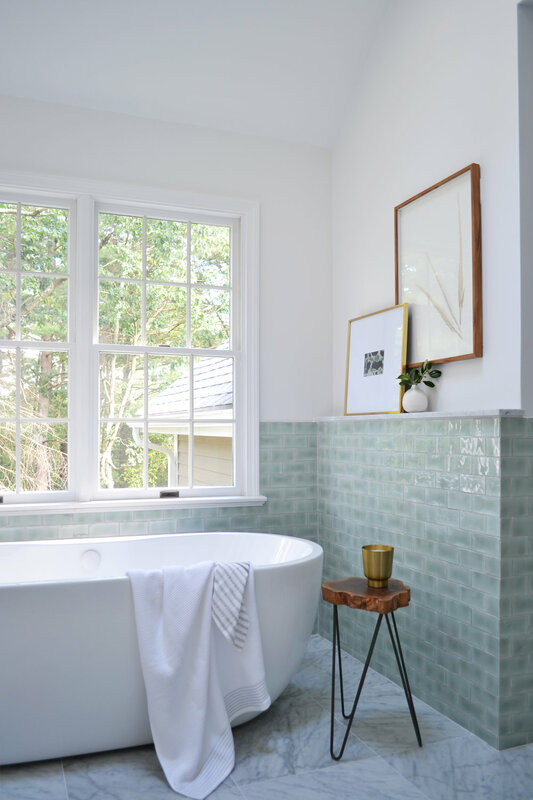 Here are our tips for bringing your bathroom from bad to, hey actually it looks pretty good. 1. Warm accents. 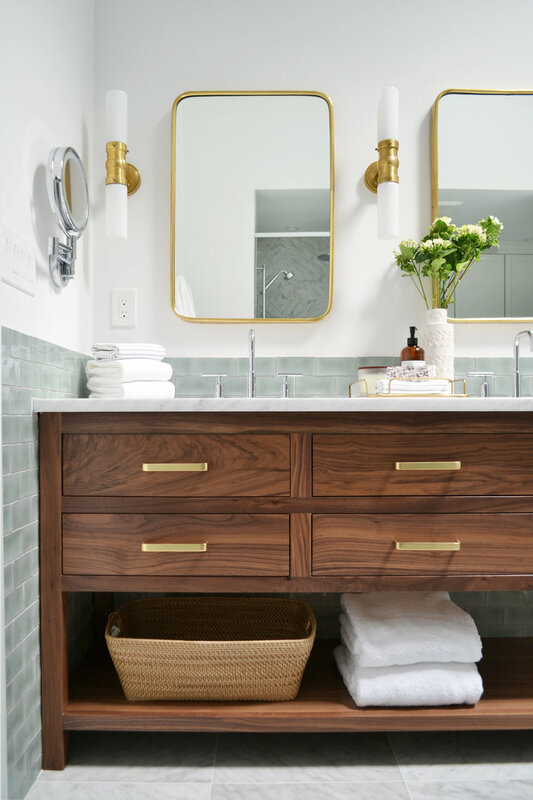 Introduce some unexpected accents with wood, baskets, and displayed linens. 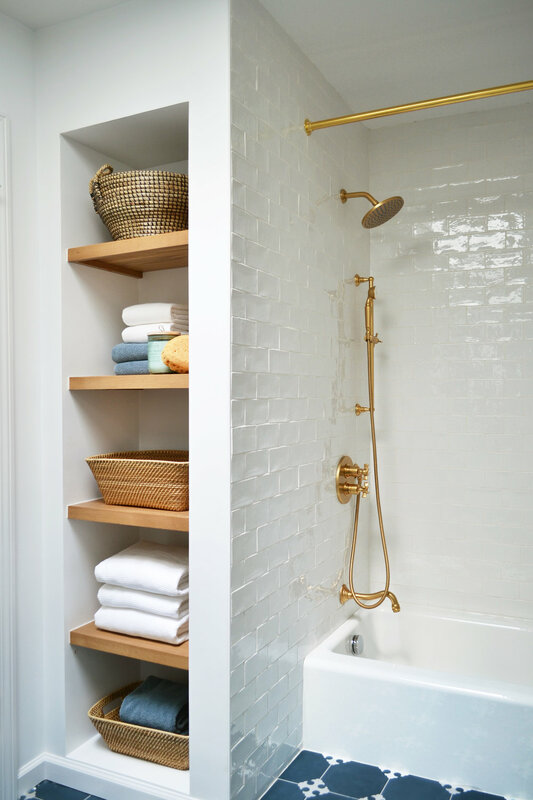 The warmth of the unusual bathroom textures immediately helps create a more inviting space. 2. Creative shower curtain. I wasn't thrilled with the shower curtain selection out there. (Although, Anthro and Urban have some great options, I didn't want to shell out $100.) So, we hung a blanket from Home Goods. I loved the tassels and the subtle stripe pattern. Option 2 was going to be a simple white curtain with DIY'd colored tassels on the edges. Option 3 was going to be two shower curtains pulled back like window panels. You could potato stamp your own pattern, dip dye, hang a tablecloth, or whatever floats. 3. Plants / dried botanicals. There are still great options if you don't have enough natural light for anything living. Fresh Eucalyptus quickly dries with no effort and still smells amazing. A bunch of Craspedia (the yellow balls) dries perfectly and adds some bonus color. Some plants will even grow without any light (the ZZ plant or Jade) or the above airplant is easily moved to a window every once and a while. 4. Nice things. Seriously. A nice set of soap and lotion on a tray, quality soft, clean towels, a lovely candle. 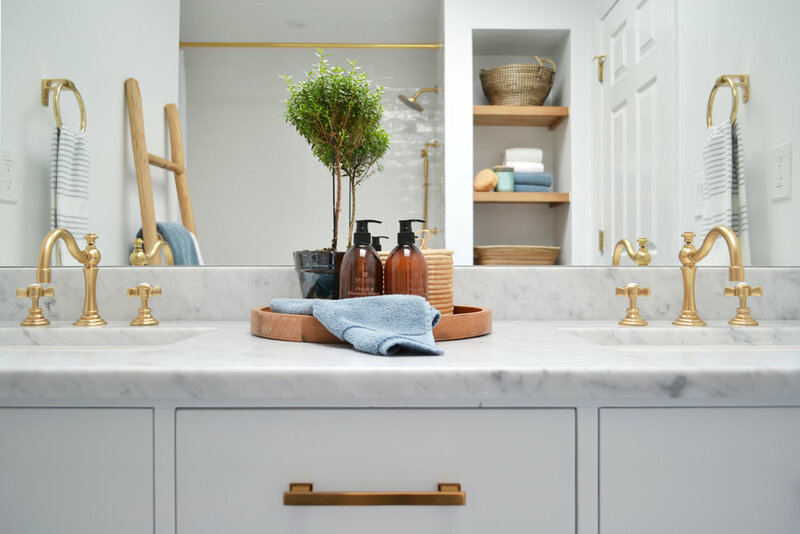 They will balance out the fact that your mirror is busted, your vanity hideous and the caulk around your sink is going gray. And your guests will appreciate the effort. 5. Hang art. 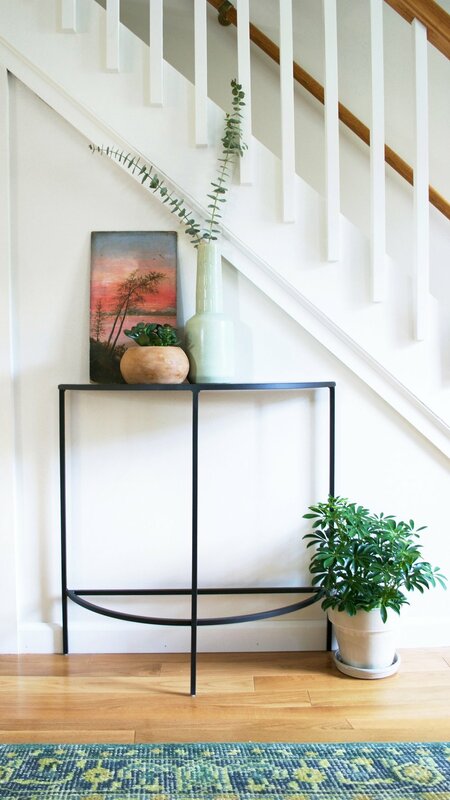 Have a little extra wall space? Hang something colorful! It distracts! 6. Freestanding furniture / rug. It's all the rage these days. 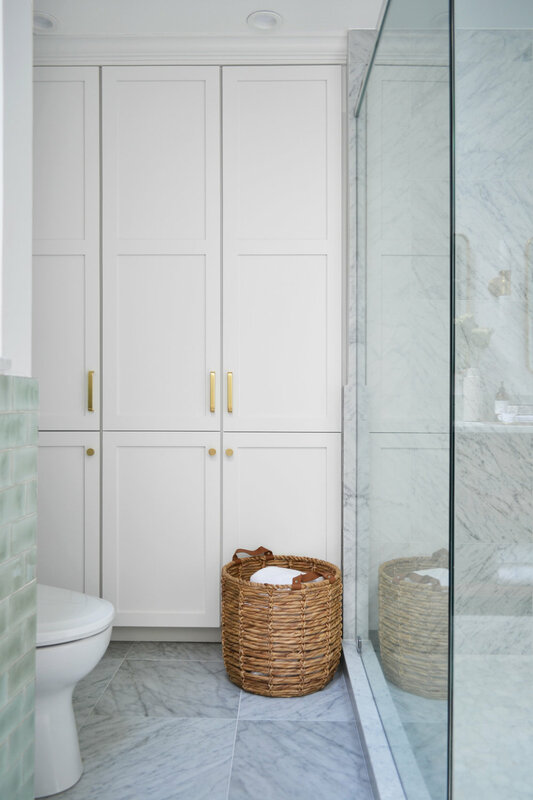 A little stool in the corner, a small ottoman, or a floating cabinet if you have the space, feels different and unique and will make your bathroom feel like an extension of your bedroom. We now have a Persian rug and I admire it every time I walk in! 7. Clean it up in there. This may upset your practical side. But it's just a fact that the fewer mouth guards, small bottles, razors, and a million other little things on the counter, the more happy you are with your space! 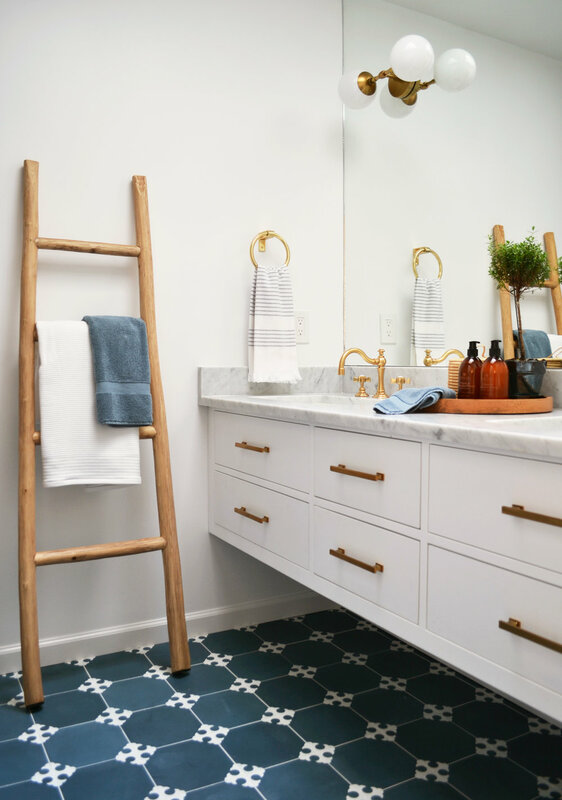 So get organized, make room for your every days things in the drawers or cabinets, and you'll thank us... I think. 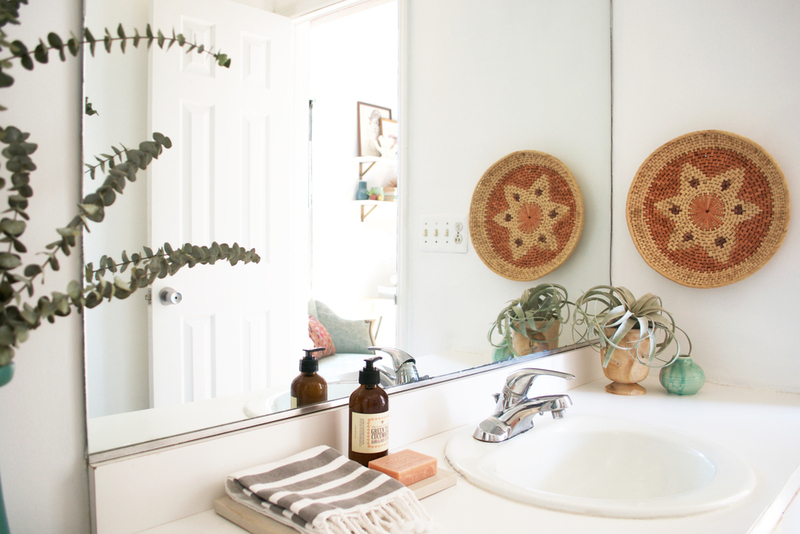 So that concludes our post on tips and tricks for disguising your crappy rental bathroom. 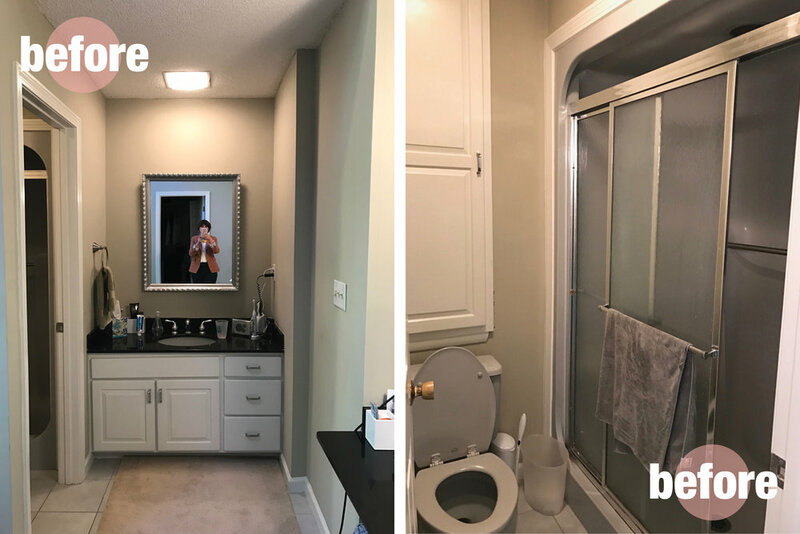 I do want to point out that we did not replace any fixtures or lighting, nor did we frame out the mirror, which could have easily been a project for another weekend. But in the end, we didn't want to spend another dime on something we can't take with us when we leave. Did we miss anything??? Let us know in the comments!